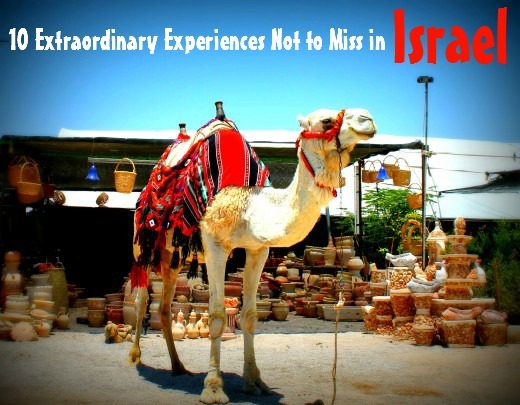 Israel offers no shortage of extraordinary, even life-changing experiences. It's not called "the Holy Land" for nothing. With thousands of years of history, it had seen Jews, Arabs, Egyptians, Greeks, Romans, Philistines, Assyrians, British, am I forgetting somebody? Its fragile antiquity is contrasted with the robust jovial spirit of the Israelis, and there is a deep spiritual undertone to life there that can make even the most adamant nihilist contemplate the mysteries of the human existence. In other words, this land is special.The following list illustrates the fact. Old Jaffa (locals call it Yafo) is a charming ancient port city in the vicinity of Tel Aviv and one of the most extraordinary places in Israel. It's so eclectic! Somehow it combines Turkish clock towers, Judaica shops, antiques, vintage flea markets with modern art and jewelry studios, galleries, cafes, and other attractions. 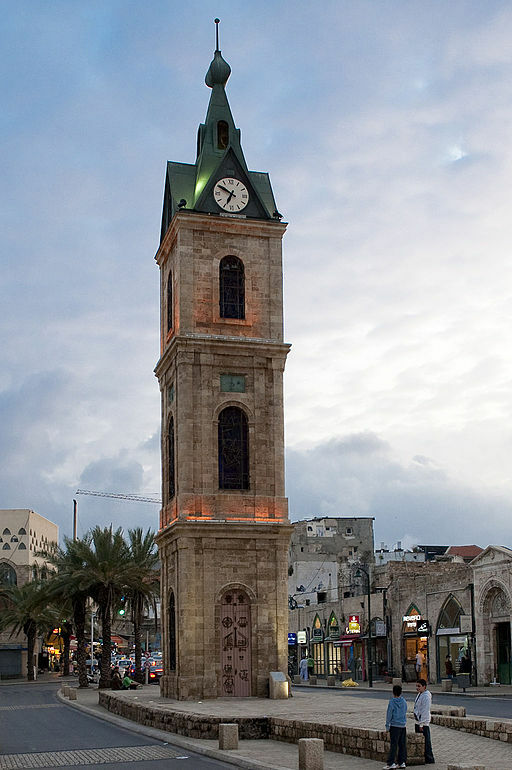 You can't miss the Clock Square - arguably, the heart of Jaffa. The whole area can be explored on foot, and there is a free Old Jaffa guided tour every Wednesday at 10 AM, meeting point: Jaffa tourist information center, 2 Marzuk Ve'azar st. If you're not a guided tour kind of person, come to Old Jaffa at night, when this ancient port city really comes alive, and the narrow stone alleys seem to be crowded by the ghosts of sailors, merchants, soldiers and others who once visited Jaffa or called it their home. All that walking is bound to make you hungry. Stop by "The Old Man and the Sea" for fresh Middle Eastern dishes at decent prices, the view of the Jaffa harbor, and the smell of the sea. An old college friend who moved to Israel many years ago took me there, so this is a recommendation from a local. Be warned though: they offer so many delicious starters (which they bring out as soon as you're seated), that you might want to go light on main dishes. And the view... unbelievable. I regret not taking any photos of it, I was too busy reminiscing. Open 'til midnight. 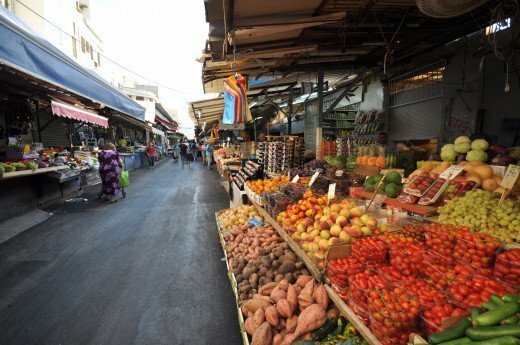 Tel Aviv offers another unforgettable experience - shopping at the Carmel Market (Shuk HaCarmel), the largest food and clothing market in Tel Aviv. 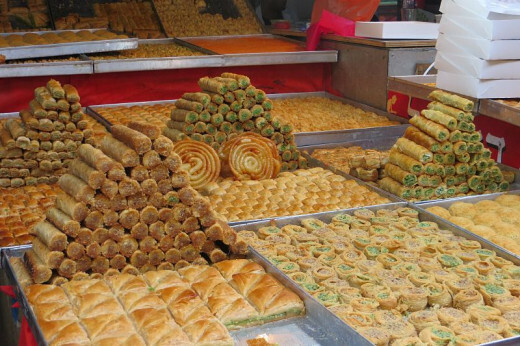 If you enjoy the hustle and bustle of street markets, want to experience a real Middle Eastern market or just buy fresh food, visit this place! Amazing selection of meat and sausages, cheeses, spices, fresh pastries, fruits, along with clothes, hats, souvenirs, and all the local charm you can take! Haggling is encouraged, but not necessary. 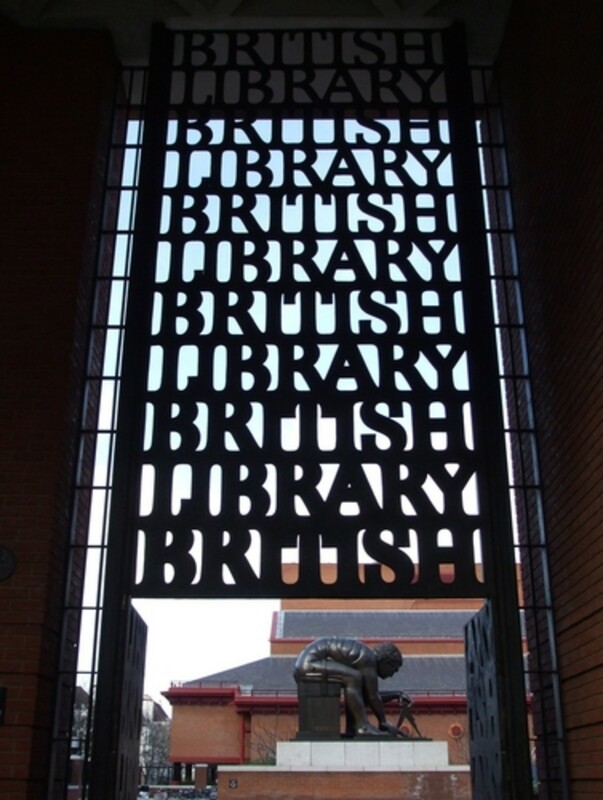 Open every day except Saturday, from 8 AM until evening (on Fridays all the shops close earlier for the Shabbat). Since Israel is the only country in the Middle East where being openly gay is acceptable, an annual Tel Aviv Gay Pride Parade is a huge event that attracts thousands of people from all over the region. It's no wonder Tel Aviv is called The Best Gay City in The World. Even if you're not gay you can still feel the solidarity with the LGBT community. In the end, it all comes down to human rights, freedoms and personal pursuit of happiness. What an incredible spectacle! The parade moves through Tel Aviv's main streets and culminates at the beach, where participants jump in the water to cool off, before continuing to party all day and well into the night. The music and the atmosphere of celebration are very contagious. The sun's blazing, like it should be in a desert, so every ten minutes someone sprays the crowd with a water gun. Young gay men wearing nothing but pink thong-style speedos. Beer vendors offering cold bruskies in portable plastic cups. I really enjoyed this experience. To see so many different people coming together in their kinkiest outfits and supporting this cause (but mostly just having wild crazy fun) was truly extraordinary. The Western Wall is arguably the most sacred structure in Israel. One of the most recognizable symbols of Jewish perseverance, it is the only part of the Great Temple that survived the Roman destruction in 70 AD (Siege of Jerusalem) that ended the Great Jewish Revolt against Rome. 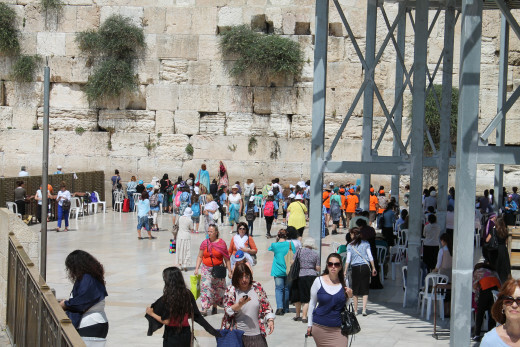 An immense religious yearning that you experience standing next to the Wall is indescribable. Many people cry, others pray with their heads touching the wall, or stuff prayer notes into the crevices in-between the ancient stones. The Western Wall must have absorbed millions of prayers over the last 2,000 years. Standing at the Wall, the feeling of awe is truly overwhelming for Jews and gentiles alike. The Old City of Akko (Acre) is a perfectly preserved Crusader city with ancient fortresses, knight's halls, citadels, churches, mosques and synagogues, surrounded by Akko's most distinctive feature - the surviving ancient walls that wrap around the Old City. 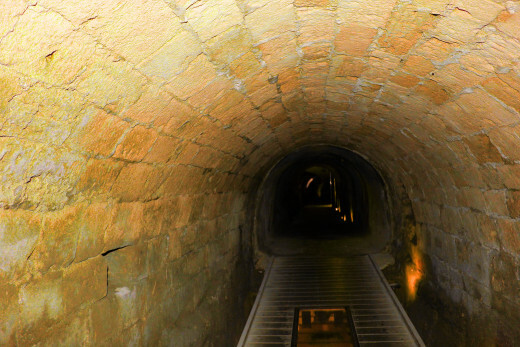 Whether you decide to explore the Crusader City (Gothic halls underneath Ahmed el-Jazzar's citadel dating from 1104 to 1291), old subterranean tunnels, Turkish baths or crypts, Akko is guaranteed to impress even the most spoiled history buffs. The Templars' Tunnel is one of the most unusual historic sites I've seen. The Templars were a monastic military order that guarded pilgrims arriving to the holy places. It was originally a secret escape route from the Templar fortress to the sea in case of an attack, a distance of 350 meters. 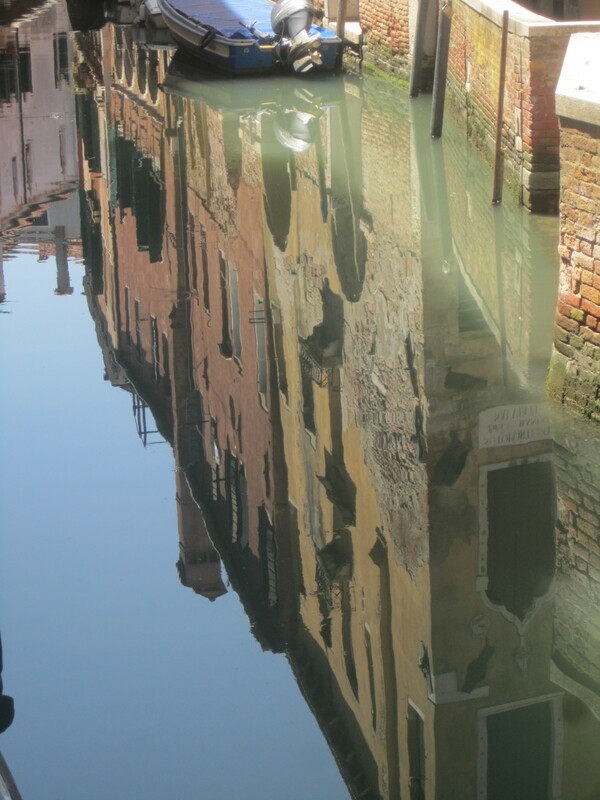 Later on it was used to smuggle goods into the city. Going through the tunnel gives you a really eerie claustrophobic feeling - history just doesn't get any cooler than that. At 400 meters below sea level, the Dead Sea is the lowest spot on the face of the earth. It's basically a big salt lake. It's so salty that there are absolutely no life forms living in it. It also means that people can easily float in the Dead Sea due to buoyancy. The water actually feels kind of slippery to the touch, and the skin gets ultra-dry because of the abundance of minerals in the water, so an immediate shower is preferable. 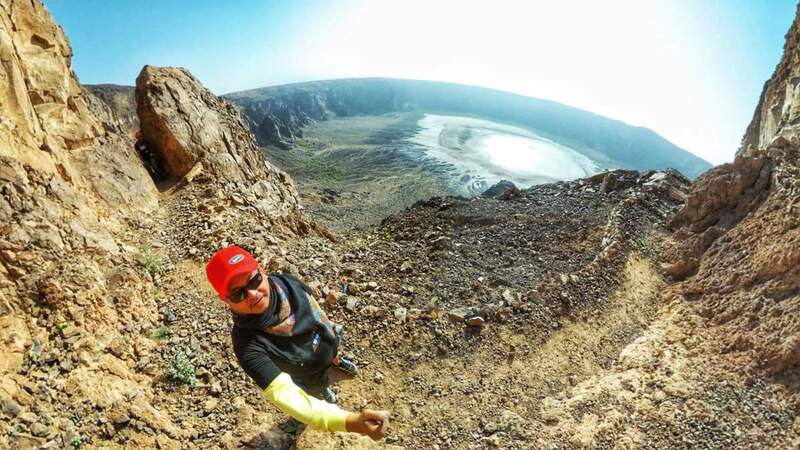 The main thing you need to know about taking a dip in the Dead Sea is: NO SPLASHING. The salty water hurts like hell when it gets into your eyes, so every movement in the Dead Sea has to be slow and careful. Minimal swimming, no jumps, and absolutely no diving! Also, about 30 minutes is the recommended duration of time in the "dead" water, anything longer than that is unnecessary. Sophisticated geometrical landscape design surrounding the golden dome of the shrine...Natural beauty and architecture. Harmony and elegance. 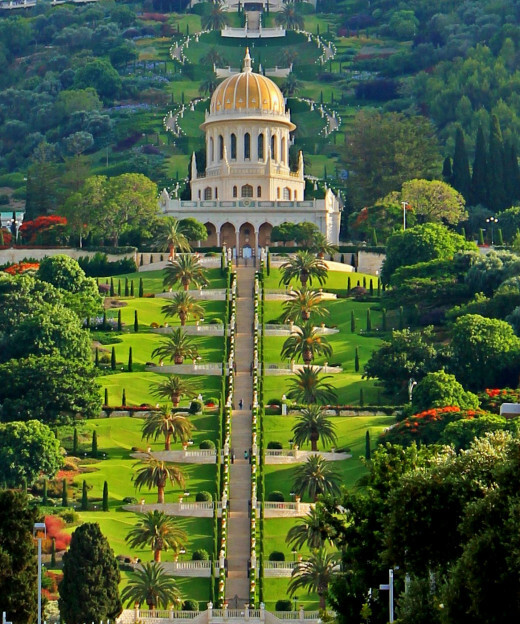 Those are the words that come to mind when I think of the Bahai Gardens in Haifa. Turns out, Israel is the world center of yet another religion - Bahai. Bahai (Bahá'í) is a sort of utopian philosophy that emphasizes the oneness of mankind, universal peace, equality and the common foundation of all religions. Although Bahai is a modern religion, it has rich traditions intertwined with other spiritual traditions. The shrine itself has nine sides representing nine major world religions, and the gardens are designed in nine concentric circles with the shrine at the center. They were inspired by the tenants of the Bahai faith. This is probably one of the most beautiful (and meticulously maintained) places in the world. 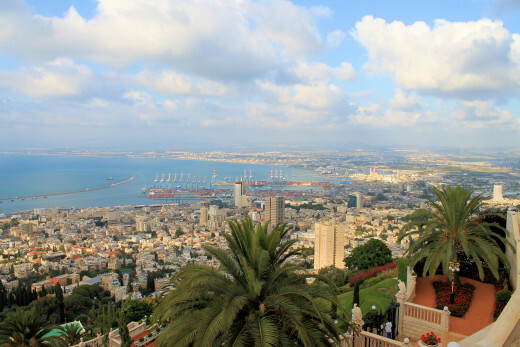 The admission is free, you can learn about the Bahai faith, and the view over Haifa bay is breathtaking. Visiting hours for the Inner gardens: 9:00–12:00 daily; for the Outer gardens: 9:00–17:00 daily. Ideally, you would want to see it inside and out, but that option is only available to Muslims, so unless you're one, the next best thing is seeing it up-close, but from the outside. The Dome of the Rock is a 7th-century Muslim shrine (not a mosque as some erroneously believe), and a masterpiece of Islamic architecture. It's built on the holiest site in Jerusalem - the Temple Mount. Everyone considers the site sacred, but for different reasons. To Muslims, this is the site of the stone from which Muḥammad is believed to have ascended to heaven. 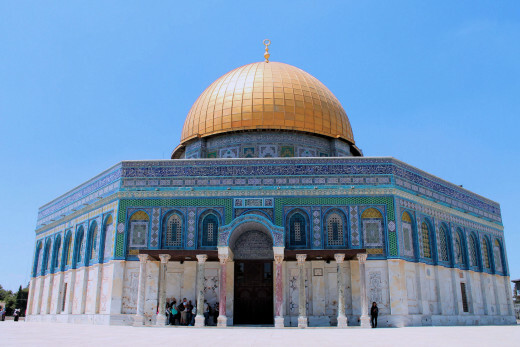 The Dome of the Rock (Qubbat al-Sakhra) was built on top of it. In Jewish tradition, this is the same spot on which Abraham prepared to sacrifice his son Isaac, and the site of the Solomon Temple. This is the direction to which Jews turn during prayer. And to Christians, the site is holy because...Jesus probably walked on it or something. 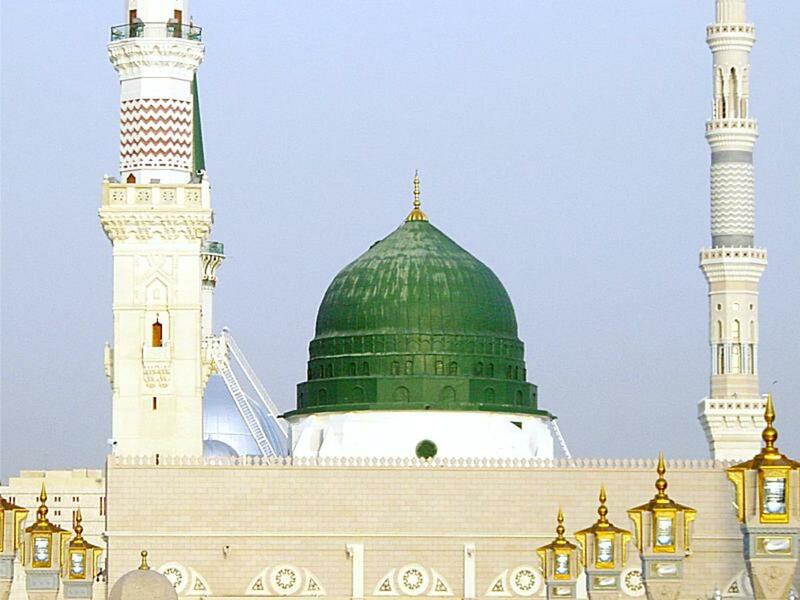 The Dome is only open to Muslims (8:30 to 3 p.m. daily), but at certain times (early in the morning and one hour in the afternoon, Sun-Thur) non-Muslims can visit the shrine's courtyard. Not many people know that because we were the only non-Muslim group around the Dome, and quite honestly, we got a few unfriendly glares from the group of Muslim men praying. So this is a really religious site. If you do decide to visit, be prepared to endure some waiting in line, possibly in the blazing sun, and then going through tight security. Women's knees and shoulders should be covered, and no midriffs either! Men's knees should also be covered, so if your shorts aren't long enough, you'll be asked to wrap a scarf around yourself or something. Also - no religious symbols. We were told to put away all crosses, stars of David, pentagrams etc. I was actually nervous going through the security because I had a rainbow hand fan in my bag from the gay parade I attended a few days earlier. I figured, if they don't like crosses, a gay hand fan might be an issue. But the security guard looked at it apathetically, with no glimmer of recognition, and put it back in a bag. Caesarea is an ancient Roman city that Herod the Great built over 2,000 years ago. It's located somewhere in the middle between Haifa and Tel-Aviv. 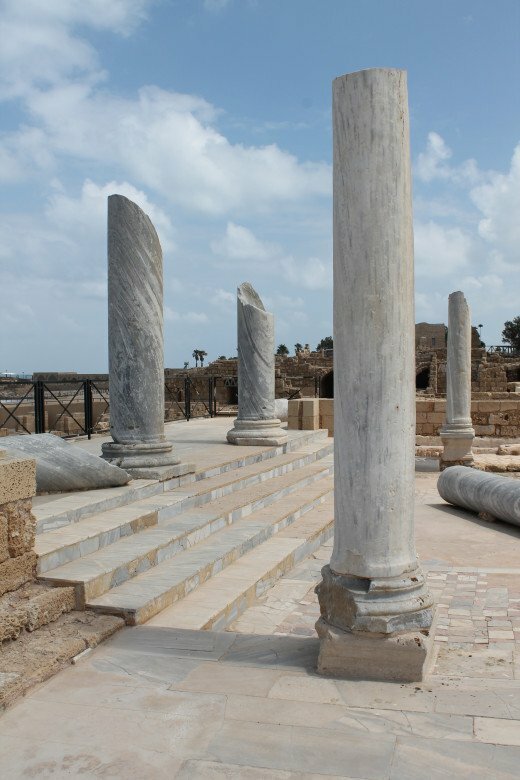 Caesaria is simply overflowing with Biblical history and mythology. 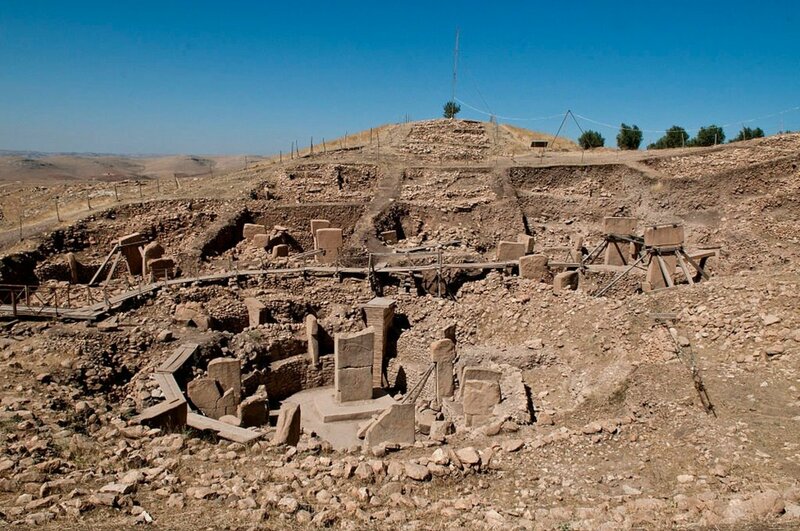 At one time it was actually the Roman capital of the Judea province during the time of Jesus. Pontius Pilate, the 5th procurator of Judea who ordered Jesus' crucifixion, was from here. You can even see a stone tablet near the amphitheater inscribed with the name Pontius Pilate, and dedicated to Tiberius Caesar who nominated him as procurator. The tablet says: "Tiberieum, Pontius Pilatus, Prefect of Judea". This is also where Simon (Peter) converted the first non-Jew (Cornelius) to believe in Jesus, and where Paul was imprisoned for two years. In 1265 the sultan of Egypt destroyed the city, which remained in ruins for 600 years, until 1884. 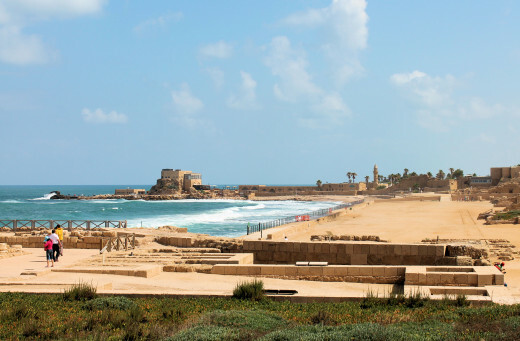 Today Caesarea's antiquities park is one of the must-see attractions in Israel, with unique structures like a Roman amphitheater, the hippodrome, bathhouses, temples, the aqueduct, and other ancient ruins. 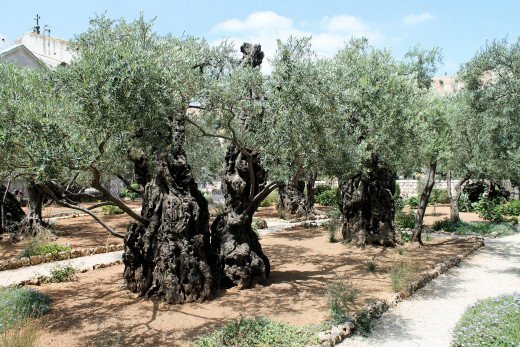 The garden at Gethsemane is a small grove on the Mount of Olives with olive trees thousands of years old. According to the Bible, Jesus frequently went to Gethsemane to pray (John 18:2), and he was here after the Last Supper, on the night he was betrayed and arrested. 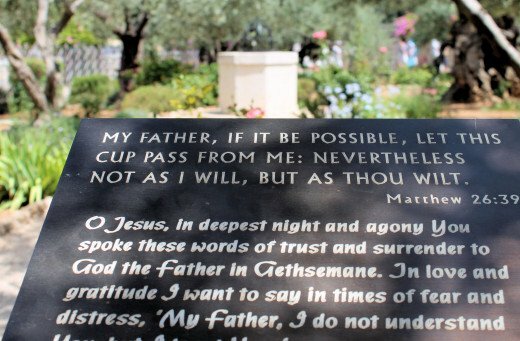 Needless to say, the Garden of Gethsemane holds unique spiritual significance to the Christian believers. The olive trees that we see today may have been the same trees that "witnessed" Jesus' prayers and his ultimate demise. This is where Jesus asked his Father to "let this cup pass" from him, yet still submitting to god's will. Many people come here for worship and contemplation, and each year on Holy Thursday worshipers keep vigil in prayer during the Holy Hour. Isn't Israel a war zone? Not really, unless you plan on visiting a mosque in a mini skirt. Israel is a very safe country, evident by the fact that each year millions of people visit the Holy Land. Naturally, during the times of the conflict escalation tourism decreases, but it never really stops. Don't get me wrong, Israeli-Palestinian war is real, and the reality of this conflict dictates that some caution is advised. But it's mostly confined to Gaza and other Palestinian territories. Israelis learned to be hyper vigilant, and there is security everywhere, especially in places of interest. Even walking into a Tel Aviv supermarket requires showing a guard the contents of your purse, but nobody minds because it means everyone's safer this way. Thank you Carol! It's a huge compliment coming from a native. I am so enamored with Israel and this hub only scratches the surface of what this great country has to offer. Thanks for stopping by! Love this hub, as an Israeli it makes me proud to see what our tiny, young country has to offer. Wonderful article. Next year in Jerusalem! No I'm Catholic, but Christian, Jewish or Muslim It all started there in Israel. The Muslims revere Abraham as their patriarch as well. I hope it won't come to that. I'm of the opinion that more guns don't make us safer; in fact, mo guns, mo problems :) I did see a lot of military men during my visit, but it seems that they've got a good handle on security within the Jewish state. Now, what happens outside of it is a different matter...Thanks for stopping by, Ron! Thank you! Are you Jewish, Mel? Or you're referring to the Christian heritage? Well, doesn't matter, I guess it's everyone's heritage, like you said :) If you go (or when you go), don't waste much time on Tel Aviv, Jerusalem is where that special energy is. Thanks for stopping by! 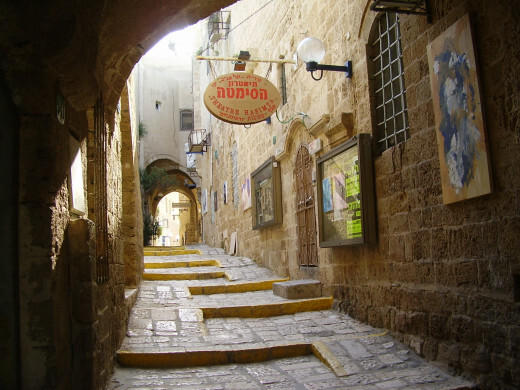 The photo of the street in Old Jaffa brings back memories of my visit to Israel more than 20 years ago, now. With regard to security, I remember seeing a bus full of school children on a field trip accompanied by adults with assault rifles slung over their shoulders for protection. I would guess that hasn't changed. It may not be long before we are taking similar precautions here in the States. I would love to go there some day. I'm not a hyper-religious person, but I do appreciate history and I do appreciate my heritage. The heritage of a lot of people; the way that we act, think, speak and write comes from this region. Great hub! Now I really want to visit Israel. I love those trees in the Garden of Gethsemane and want to pet the camel. Thanks for giving the tour. It was very interesting and detailed and makes me want to travel there. Voted up and awesome.